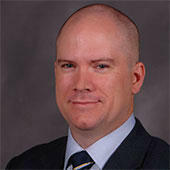 The idea of information architecture was what initially attracted me to the field of User Experience some 15 years ago. Working in a small graphic-design studio as the only Web designer for an ad agency, I designed Web sites, often coding them myself. Sometimes, clients sought more complexity in their Web sites. They needed interactions, information processing, and, in some cases, a precursor of customer-relationship management (CRM). During that period, it occurred to me that, to be successful, Web designers had to do more than just create attractive Web sites. Because we were creating something new, the language of critique that had developed for modern graphic design, which was rooted largely in print design, was inadequate for the work we were now doing. So, in an effort to augment our design vocabulary to describe the new artifacts we were creating, we borrowed some terms from the adjacent fields of industrial design, human factors, and of course, architecture—among many others. In a wide-ranging discussion, Arango describes the role of information in our lives and its relationship to the physical world—through the lens of an architect. Much of the literature that I’ve read pertaining to information architecture has approached the concept primarily from a library and information sciences perspective. The literature discusses hierarchies, taxonomies, metadata, ontologies, and lots of other concepts that are familiar to information scientists. While these concepts are accurate and helpful, something is missing. Information architecture focuses on the first half of that discipline and seems to ignore the second. It is especially curious that, although Richard Saul Wurman—a bona fide architect—coined the term information architecture, there are few books on the subject that have been written from an architect’s perspective. Further, in academic environments, we generally find programs covering information architecture in information, computer-science, or design and media departments. Most architecture schools focus wholly on the construction of physical spaces. 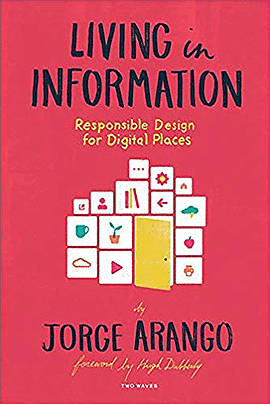 However, Jorge Arango’s new book Living in Information: Responsible Design for Digital Places shows that the lessons and concepts of architecture have application far beyond built environments of wood, steel, stone, and glass. Arango, another trained architect, consistently presents information-architecture concepts using metaphors from architecture. In a wide-ranging discussion, Arango describes the role of information in our lives and its relationship to the physical world—through the lens of an architect. Topics range across how buildings embed information, social media, propaganda, blockchain, and others. Living in Information provides several examples of how the discipline of architecture communicates the use of built spaces, as well as how its conventions have come to influence behavior. What is an information space? I think most people would define an information space as a place where you can get information you need or want. Libraries and museums are traditional information spaces. Certainly, Web sites, mobile apps, and desktop applications are obvious modern examples of information spaces. We might expand that definition to include facilities for buying and consuming music and videos—so concert halls, movie theaters, book stores, and record shops could then qualify. Maybe we could consider a coffee shop or a bar—where you can read a book or watch a football game—as an information space. Don Norman has described his work as researching and understanding how the tools we use communicate with us. The artifacts we use throughout our lives convey their utility through their design and the inclusion of signifiers that convey affordances and constraints. Arango applies similar insights to our information environments. Because all environments—whether built or virtual—convey information, we could consider every space an information space. How do we know where the entrance to a building is? What tells us what kind of building we’re looking at? Living in Information provides several examples of how the discipline of architecture communicates the use of built spaces, as well as how its conventions have come to influence behavior. In an example from the book, the architecture of a bank conveys a certain message: confidence. It also encourages a specific level of decorum—in contrast to the design of a sports arena. The importance of information architecture at the structural level is similar to an architect’s focus on the structure of a building. Structure ultimately impacts the experience of using the building…. Although the creation and consumption of information continually rises, interest in information architecture waxes and wanes. Nevertheless, just as in the architecture of buildings, we can observe some basic principles for defining the use of an information environment. While building methods and preferred materials may have changed over time, the fundamental practice and philosophy of effective architecture remains the same. Society and organizations are often enamored of technology, so assume that novel innovations will solve people’s problems. For example, companies enlist chatbots to improve sales and support on their Web sites. They install search appliances in the belief that they’ll magically reveal hard-to-find resources to employees and customers. Current discussions suggest artificial intelligence is the new panacea for improving user experiences. Of course, the human component and the way we structure information directly impacts the performance of all these technologies and how well they serve people. But such novel approaches are akin to changing the fixtures—maybe even the touchless ones!—in a bathroom because family members must wait too long to use the bathroom in the morning. While new fixtures might give the appearance of being an improvement and people might like using them at first, this is just a surface-level improvement. The structural problem—the number of bathrooms—still exists. Arango’s key insight is that the importance of information architecture at the structural level is similar to an architect’s focus on the structure of a building. Structure ultimately impacts the experience of using the building and constrains its future use and sustainability. UX professionals must consider all layers of the experienced environment from structural to stuff—as described in Stewart Brand’s model, which Arango has included in his book. A relationship exists between information, which humans crave in ever-increasing amounts, and attention, which is available in smaller and smaller amounts. At the DUX (Designing User Experience) conference in 2007, a speaker whose name I don’t recall made a statement that, at the time, was revelatory to me: the scarcest resource in the world is neither oil, nor fresh water, nor topsoil; it’s attention. There is only so much attention our brain can dedicate to any stimulus or task. Plus, the competition for our attention is rising. Human evolution is a very slow upgrade path and, while a number of authors and studies have provided insights into how we have adapted to prioritize the information we encounter, it is easy to overwhelm a person’s working memory. Thus, the role of the UX designer is vital to designing tools and processes that enable people to achieve their tasks confidently, without overtaxing their cognitive ability. Arango’s discussion of the role of attention is an especially insightful part of his book. A relationship exists between information, which humans crave in ever-increasing amounts, and attention, which is available in smaller and smaller amounts. Someone has said of social-media firms and free services such as Facebook, Google, and others that, if you cannot identify the product, you are the product. While this is an interesting turn of phrase, it may be more accurate to say—as Arango does—that these firms are actually mining your attention. The business model of mining and selling the attention of the masses is the basis of social-media companies, which cannot sustain themselves on subscriptions and outright sales alone. Of course, this model has been extended to subsidize many firms and social-media networks. What I liked most about this book is that it made me think. Its ideas are neither prescriptive nor as easily applied as those from other books on the subject of information architecture. Still, Arango’s book follows the example of some other authors. I found myself making comparisons to Peter Morville’s Ambient Findability and Adam Greenfield’s Everyware. This is not to say that Arango’s work is derivative—it is not. Rather, the book provides contemporary documentation of the ever-increasing role that information plays in our lives. In fact, it suggests that the design and architecture of information are just as vital to culture as the physical structures that have become hallmarks of civilization. This is a rather difficult book to describe because its subject matter touches so many parts of our lives. Ultimately, what I liked most about this book is that it made me think. Its ideas are neither prescriptive nor as easily applied as those from other books on the subject of information architecture. However, this book does clearly illustrate the imperative for information architecture and its role in our lives and culture. Note—An excerpt from this book is available on UXmatters! Thanks to my friend Samantha Bailey for recommending this book for this month’s review.